It’s that time of year: round one of the footy (well, what many of us in Australia consider to be real football… rugby league… NRL…) season. Time to barrack for your favourite team, which for the G.O. 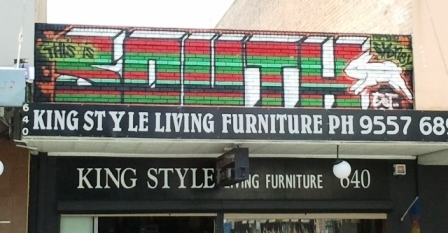 & I is the South Sydney Rabbitohs (whose traditional home territory is Redfern & surrounding inner city Sydney. The neighbouring Newtown Jets departed the NRL in 1983). Is it an auspicious omen that we spotted this street art a week or so ago above a shop on the south end of King St, Newtown, NSW, Australia? This entry was posted in Blog and tagged Australia, football, my life, Street Art. Living furniture? I never got used to the Playtex living bra… I didn’t know what to feed it.